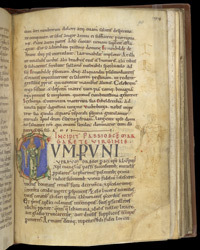 In this manuscript's accounts of the lives of Sts. Wilfred of York, Werburga of Chester, and Margaret of Antioch, only the last has an historiated initial. Margaret was venerated throughout Christendom, but Wilfred and Werburga we both particularly venerated in northern England. At least one other part of the manuscript in which this text is bound belonged in the Middle Ages to Beauchief Abbey, a short distance to the south Sheffield, approximately half-way between Chester and York. St. Margaret is depicted in the initial 'C' (itself formed of a fire-breathing dragon) holding a book and banner. In the right-hand margin someone has attempted to draw slightly different version of the saint and her book.